The DOJ will bill the OBPE ~$500 for having to write this order. All because their Director, Charles J. Hill, spent weeks ignoring a public records request for the rules that he claims allow him to keep the public out of the hearing about the $5K fine that the OBPE recommended for UO Counseling Director Shelly Kerr. Then Hill tried to use a petty $2.75 fee to delay release for two more weeks. Ridiculous. The documents he’s been trying to hide are the OBPE“Notice of Rights and Procedures” and documents showing this was adopted according to state law. Call me slow, but I’m starting to wonder if it was. We’ll find out, Hill’s got a week to provide the documents at no charge, and I’ll post them when he does. Meanwhile the Oregon Office of Administrative Hearings is telling me that no hearing on the Kerr fine has yet been scheduled. Here’s an email exchange with Charles Hill, the Director of the OBPE, in chronological order. 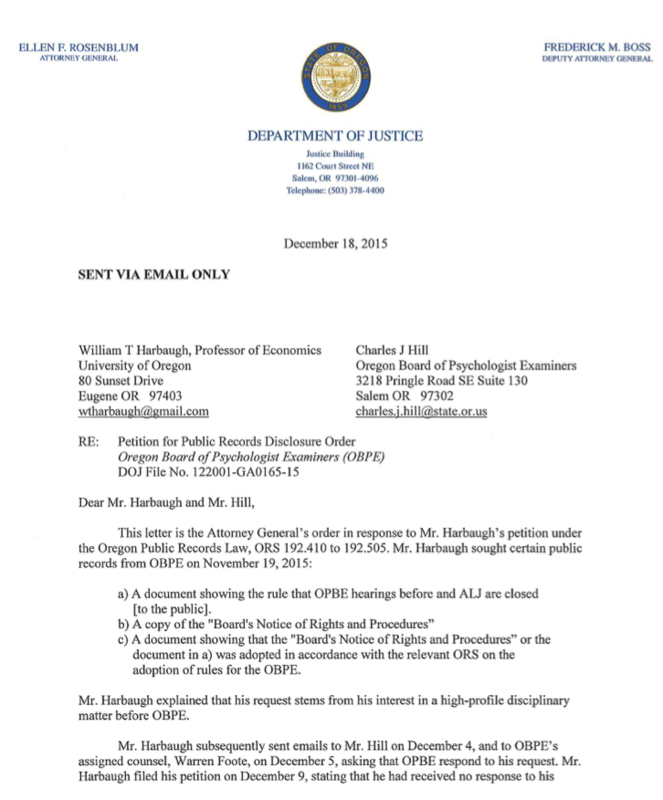 Mr. Hill is trying to argue that he can close the upcoming OBPE hearing in front of an Administrative Law Judge about UO’s appeal of the OBPE’s $5,000 fine against Shelly Kerr, who gave the Jane Doe Counseling Records to UO’s lawyers Doug Park and Sam Hill. I ask Hill for a copy of the rules that allow the hearing to be closed. He waits for 3 weeks to respond, then tries to use a $2.75 charge to further delay release of the records. I’m ccing AAG Michael Kron, the head of the DOJ’s Task Force on public records reform, because your use of delays and fees to frustrate the release of public records is so classic that it might serve as a useful example of how state agencies are manipulating current law. The emails below show a simple request for your board’s “Notice of Rights and Procedures” and documents showing this was adopted according to state law. You managed to avoid even responding for 21 days, until I filed a petition with AG Rosenblum. Your response proposes an additional delay of 2 weeks, plus the time needed to send you a check for $2.75. My request asked for a fee-waiver on the basis of public interest. Given that the UO counseling records incident that led to the hearing at question have been the subject of many news stories in the local, state, and national press, and to proposed and adopted changes in state and federal law, I don’t think there’s much to argue there – the interest certainly exceeds the cost of the $2.75 fee you propose. In any case, if you disagree and do not want to waive the fee, the public records law requires that you explain why you think it is not in the public interest to waive the fee. Your letter doesn’t even try. Given Mr. Hill’s obstinance, I’m also beginning to wonder if the OPBE (sic) actually has the authority to close these hearings. The AG’s opinion on his $2.75 fee is due Friday. I’m sure you understand that the Shelly Kerr case I asked about below is not a “hearing before the Board of Psychologists”. That’s over. It’s an appeal of an OPBE decision, and it will be held before an Administrative Law Judge, not before the OPBE. I can’t find any indication in the Oregon DOJ’s Public Records and Meetings Manual to indicate such a hearing would be closed and not open to the public. I’m ccing AAG Michael Kron, the DOJ’s transparency czar, in case I’ve missed something. (1) The agency may by rule or in writing identify persons or entities who shall be parties or limited parties. (2) Persons who have an interest in the outcome of the agency’s contested case proceeding or who represent a public interest in such result may request to participate as parties or limited parties. Unless otherwise provided by law, a person requesting to participate as a party or limited party shall file a petition with the agency and shall include a sufficient number of copies of the petition for service on all parties. (3) The petition shall be filed at least 21 calendar days before the date set for the hearing, unless the agency by rule has set a different deadline or unless the agency and the parties agree to a different deadline. Petitions untimely filed shall not be considered unless the agency determines that good cause has been shown for failure to file within the required time. 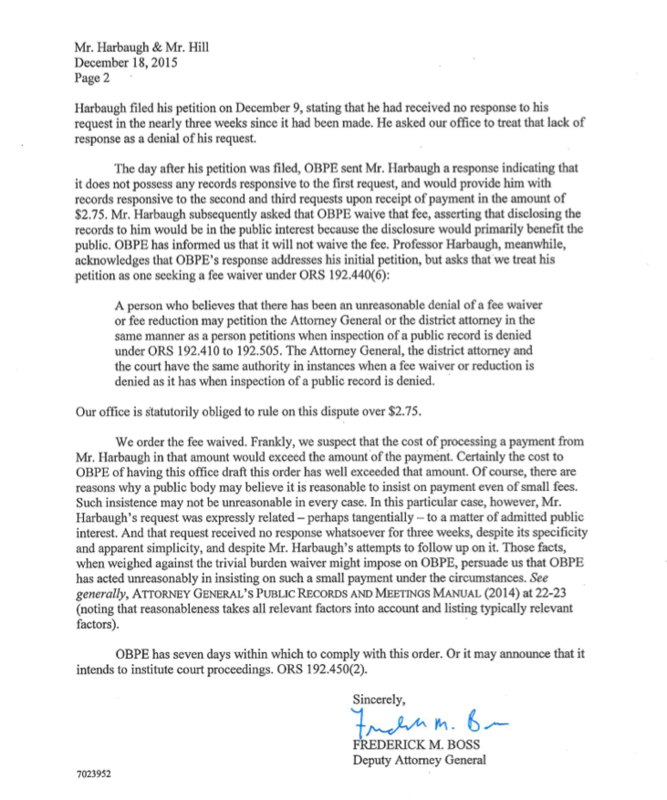 Therefore this is a public records request for any documents concerning the scheduling of an appeal of the OPBE’s ruling against Shelly Kerr, and the name and contact information for the ALJ. I ask for a fee waiver on the basis of public interest, as demonstrated for example by the many excellent Oregonian reports by Rich Read, reports in the Chronicle of Higher Education, etc. The Board considers all cases under investigation confidential from conception through the hearing process and through to the final order stage. Thus, hearings before an ALJ are closed to the public. You are welcome to write a formal letter of petition to the Board who may choose to overturn my decision. You may address your letter of petition to the Board Chair, Dr. Fran Ferder, to request to participate as a party or limited party, in accordance with OAR 137-003-0535. Your letter may be sent to: Oregon Board of Psychology Examiners, 3218 Pringle Road SE, Ste 130, Salem, Oregon 97302-6309. As of today, the case that you are referencing has not been scheduled by the ALJ for hearing. Good luck. Perhaps it is in the “Board’s Notice of Rights and Procedures”, which is referenced in OAR 858-020-0075? However I can’t find any such document on your website. 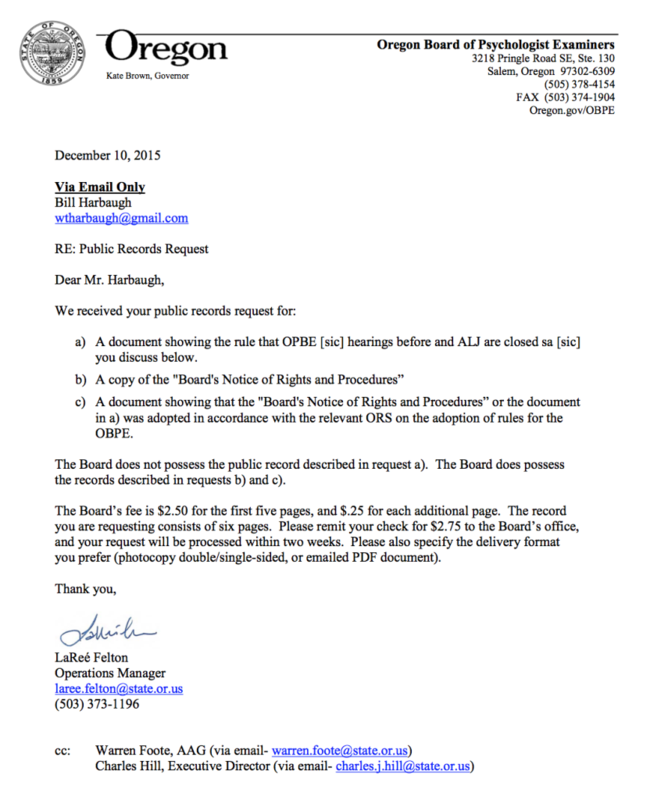 a) A document showing the rule that OPBE hearings before and ALJ are closed sa you discuss below. c) A document showing that the “Board’s Notice of Rights and Procedures” or the document in a) was adopted in accordance with the relevant ORS on the adoption of rules for the OBPE. I ask for a fee waiver on the basis of public interest. Please email electronic copies of these documents to this email address. THE OMB’s OAR’s explain that they adopt the AG’s model rules for hearings, and that any amendments follow the ORS requirements and notifications, etc. I can’t find any similar information for the OPBE – much less a copy of the “Board’s Notice of Rights and Procedures:, which you presumably have easily at hand. I’d appreciate it when you expect to be able to provide the OBPE public records requested below. Please email the requested documents as pdfs, without further delay. I ask for a fee waiver for those documents as well, on the basis of public interest. Tagged Jennifer Morlok, Shelly Kerr. Bookmark the permalink. 1. Through their licenses/applicant lookup feature at http://obpe.alcsoftware.com/liclookup.php. 3. Through press releases! Such as http://www.oregon.gov/obpe/headlines/Press_Release_9-25-15.pdf — signed by Hill himself. I, too, have found that corresponding with the Board’s staff is a waste of time. Their replies never contain any useful information, though their incompetent, self-contradictory lies and excuses are sometimes amusing. If you aren’t sufficiently irritated at the OBPE yet, take a look at my Unlicenesd Practitioner website. My interest in Charles Hill and his OBPE is transitory – unless, of course, he continues to use fees and delays to subvert the public records law. That I can’t abide. I’m glad to see you are more persistent. If you could summarize your view of the problems with the board in a few paragraphs, it would be helpful. Also, Hill’s latest public records ploy is to refuse to produce the email addresses that the OBPE board members use for official business. If you have those, please send them to uomatters at gmail. I’ve got a few things I’d like to share with Mr. Hill’s board. Hiding board members e-mail addresses? I wonder if they had the idea first, or got it from us? * In Oregon, licensing boards operate under “administrative law,” which is more or less a kangaroo-court system. You get a lot more due process if your dog poops on your neighbor’s lawn than if a licensing board wants to take your livelihood away. This means that licensees live in fear of their board’s arbitrary decisions. * Thus, the boards can be as high-handed and abusive as they like and hardly anyone will complain. This appeals to a certain kind of person. * Easy, often undeserved victories in the administrative law courts make a boards’ staff arrogant and high-handed, This is doubly true if the board members are gullible, or are arrogant themselves. * Oregon’s psychologist community is much smaller than the counselor/family therapist community, but the two boards have the same level of staffing. Apparently the OBPE’s staff has chosen to use a kind of busy obstructionism as the best way of demonstrating their value. I’m no licensed psychologist, but the OBPE seems to have lost its marbles. Or they are taking the classic anti-competitive role of state licensing boards – restrict entry and jack up prices for the insiders – to a new extreme. And yes, I am a PhD economist, and I would be happy to argue that in court, pro-bono. I can’t spend as much time chasing after the OBPE as I’d like, but I’ll see what comes out of Mr. Hill regarding closed meetings, and I hope you will use Oregon’s public records law to continue to try and figure out what’s gone wrong here. Please keep me updated, and thanks for your work to promote the public interest. It’s a bit worse than a ploy for established psychologists to raise their own incomes by increasing barriers to entry. There’s that, but there’s more. A few psychologists buy into the concept that, by performing rudimentary experiments on rats and students in their college days, they have a godlike understanding that escapes mere mortals. Now, psychologists are aware of Zimbardo’s “guards and prisoners” experiment and psychology’s long-standing Dodo Bird Verdict problem — where fifty years of clinical effectiveness studies pitting licensed practitioners vs. people pulled in off the street fail to show significant differences. It takes a special type of person to disregard all this. But some of them manage it. Snobbery is an amazingly flexible resource. For example, Christian Wolff’s real crime was (a) to be a mere “psychologist associate,” without the lofty doctorate that the board members have, and (b) to attend far more board meetings over the years than any board member. What’s wrong with the psychology board is that they need to be straightjacketed and placed in an environment without any sharp objects, so they’ll stop being a danger to themselves and others. There’s long been a move to combine the psychology board with the counseling/family therapy board. Ostensibly this is to save costs, but putting the psychologists in an environment where they’re a despised minority has its advantages as well. I have a sponsor (Mike Nearman) for some legislation to forbid them to indulge in their more loathesome excesses. P.S. By the way, the psychology board has exceeded its spending limit again, largely due to the expense of false prosecutions and feather-bedding, and they need to go hat in hand to the legislature for more money. I suggest you let your state legislators know that you think they can find better uses for the money.